stars - Based on 28 reviews. The 4-foot rubber parking block, made from 100 percent post-consumer tires, withstands natural elements and deflects impact. 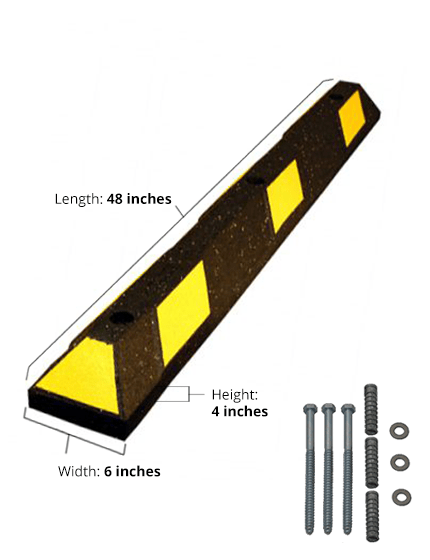 This parking curb will flex slightly to lie flat on uneven surfaces – ideal for church, school, or residential parking lots where the pavement has aged. Available in fade-proof black or handicapped blue with reflective striping for high-visibility at night. Recessed bolt holes and mounting hardware included. Concrete parking blocks are only available locally. - The Traffic Safety Store ships our recycled rubber parking blocks all over the USA (all over the world in fact). This means you are no longer limited to the styles of concrete parking blocks that are made locally. You now have choices! Concrete parking blocks are heavy. - Our 4' Recycled Rubber Blocks weigh 26 lbs. each, meaning one person can carry the block, put it where you want to install it, and install it yourself with no specialized equipment (a hammer drill does make it go faster). With concrete blocks, the company you buy them from has to deliver them on their truck. They will also need to bring out a piece of machinery to unload the blocks and put them into position for installation. All of this costs money which can make purchasing smaller number of blocks unaffordable. Lastly, when those concrete blocks break from exposure to the elements, you will need that same piece of machinery to get them out of your parking lot. 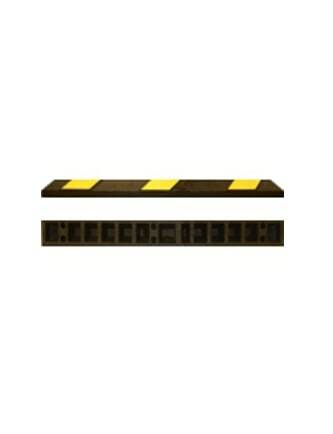 - Since the recycled rubber blocks have high visibility reflective panels molded in, they never require painting. Also, once you paint a concrete parking block once, it requires continual maintenance to look good. Recycled rubber parking blocks require zero maintenance. - Over time, all concrete installed horizontally (meaning water does not run off) absorbs some water and cracks when the water freezes and thaws. Recycled rubber parking blocks do not absorb water so freezing and thawing is not an issue. - While are recycled rubber parking blocks won't bend in half, they are somewhat flexible, meaning they will conform to uneven surfaces such as gravel or older parking spaces with a 'crown' in the center. Inspection criteria met. Our parking block was ordered, shipped and received in record time with no issues. Fantastic experience! A+ Seller. Quick ordering and shipping experience. Great product. Highly recommend. Quick and Great Service. Ordered on line and decided to add an additional parking block. I called customer service and they took care of it immediately. No problem. Shipment was quick and easy even to an island - Catalina Island, off the coast of California. Perfect! Exactly what I expected! I recommend! Ordered rubber car bumpers, arrived fast and everything was exactly as ordered. The product arrived as promised and was exactly as described. Kudos! No problems. Straight forward when ordering online and the product showed up quickly. Easy as can be....Super easy to find the products needed as well as ordering those products. Easy as can be.... Super easy to find the products needed as well as ordering those products. fast and reliable Ordered our rubber parking bumpers on Tuesday and they were delivered on Thursday via ups ground. Happy Camper !! Super EZ. Fast prompt delivery and first class quality. Thanks! Rubber Parking Blocks - I ordered 2 of the 4 ft rubber parking blocks to place in my horses stalls to keep bedding from going out to their paddocks and to keep the paddock sand from coming into the stall. We installed them yesterday and they seem to be helping quite a bit and I don't have to worry about something that could injure a horse. Shipping was pretty quick and I am happy with the product although I know my use is a bit different than most. And yes, I would order from this company again and will refer other horse owners who might want to try my idea. Good and prompt service. Awesome experience !!!!!!! My stop for parking stops. 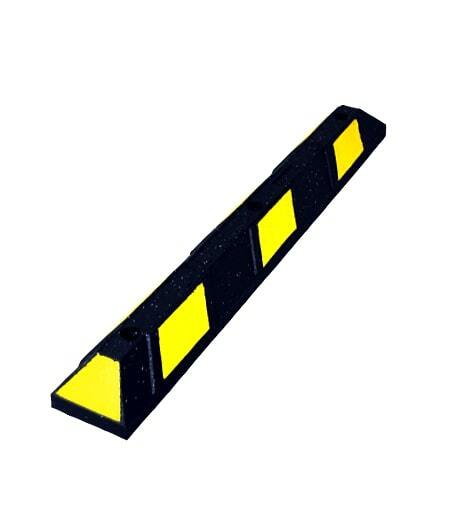 -- This is the second time I have ordered parking stops from the Traffic Safety Store. (I liked them the first time - that is why I am a repeat customer.) They shipped quickly and sell a fine product. I bought this wheel stop because "someone", (certainly not me,) kept backing up and hitting my house! Unless he runs completely over this thing it should solve the problem. "Item was well priced and arrived quickly. Thanks." "Order delivered on time and was what I expected"
"Very quick shipping. Good communication from seller. Product as described. Price was a good value. Would definitely order from them again. " "Great product..delivery was fast and left at door!" "Easy to order. Reasonable shipping cost. Good prices. Thank you!" This was 4 foot garage stop is exactly what I was looking for as it allows me to position my vehicle in the garage so that the automatic door does not damage the vehicle when activated. It is supplied with bolts if you desire to attach it to the cement garage floor; however it is heavy enough, and flexible so that it does not appear to move. It also has yellow reflectors so it is easily observed when entering the garage. Shipped very fast. Excellent seller. Very, very, helpful on the phone and the product that I ordered went out quick from the warehouse and was delivered to my home quick. I would order from them in a heart beat. Love the customer service. Some companies just do not get how important good customer service is now-a-days but that is not a problem at the Traffic Safety Store, it is an asset. Thank You. The item was mailed incredibly quickly. I believe we received it two days after placing our order, (and we live in an small town in NH). The item itself was as it was described on line and sold at a lower cost than similar sellers were advertising.